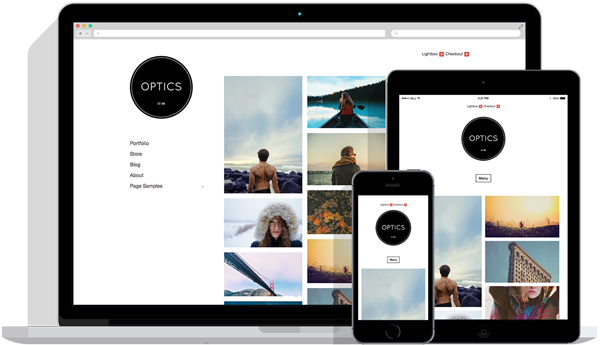 f8 lite is a free theme for WordPress that can transform your Web site or blog into a fully functioning photography or multimedia portfolio Web site. SEO optimized, iPhone compatible, grid-based css, built-in Galleria support, slideshow-enabled, built-in multimedia support, auto or manual thumbnail control, Gravatars, plus much, much more. The credit link is required to stay in tact. f8, which is a technical term referring the lens aperture setting on a camera, is theme long in the making. A little over five years ago, I began the arduous task of trying to find a way to present my photos to the world online. I primarily wanted two things: A portfolio section and a blog section built into one CMS. What I didn’t know at the time, is that it would take me five years to figure out. After researching literally hundreds of options including Flash powered portfolios (a big no-no in today’s mobile world), to countless bulky CMS’s that just didn’t cut it, I decided on using WordPress. It was well worth the wait. This entry was posted in Themes and tagged portfolio, theme. Bookmark the permalink. Thank you very much for making available this theme. You made a girl happy. I build my girl-friend’s photo blog right now. I hope it is intuitive enough for her to update regularly. Thank you! Is there any HOW-TO for the proper use of making the gallery ? 1. “image” and the set the value of this to the fully qualified path for the gallery image. 2. “thumbnail” – and set the value to the fully qualified path for the thumbnail image that will appear on the home page under the posts. These themes work great, i have combined a couple of themes to make the site work how we wanted. i like thema. thank you. I haven’t been able to find a theme options tab or page either. Is this compatible with 2.6.3? What’s the difference between f8 lite and f8 static? I can’t seem to find the answer on this page. I REALLY love this theme. everything has worked great from the get go. Great finish! I was trying to do something with it and maybe you could make it easier. I was trying to display only 3 archived posts under the slideshow. Is there an easy way to change that? Thanks. This theme looks to be broken under WordPress 2.7. It’s not working for me in WP 2.7 either. Cannot get the slideshow to launch. Any tips/advice? i´d like to try it out but it does not show up in my 2.7 installation – anybody who can help me get things donoe ? Has anyone got the slideshow to work under 2.7? If so how? Wanted to verify – Is there no ‘options’ panel in the F8 Lite? I have looked in all the menus and can’t find it. I am thinking the ‘Lite’ version is ‘as-is’ (or modified w/ your knowledge of CSS), and the options panel comes with the full F8 version? Would love to know for sure. Thanks! I’m sorry for this question, but I’m new in using wordpress themes and the panel. I’ve just downloaded the F8 lite teme and uploaded into my wp content folder on siteground. I’m now actually trying to understand how to manage the contents (pics, texts, link) in order to obtain the same presentation of the Demo! Do I have to pay to have a control panel or I can use the wp panel? nobody seems to be replying here to all the questions. Is there a demo or tutorial for setting this up? I’m a newbie at this but since I first installed and customized F8-lite two weeks ago there has been a theme upgrade. If I upgrade now will I lose all my customizations? you say that it’s free but impossible to download it..
if you’re making us pay with our info to ‘sign up’. What exactly are the differences between the f8 theme and the f8 lite theme? I guess there are differences in customizability. But what _exactly_ are these differences? It’s impossible to decide for a theme if you don’t clearly state the differences between them for a user. with f8 lite and wordpress 2.7.1. It doesn’t work. I can’t see no widget to add the gallery to the front page such as displayed on your page. And it’s not integrated with wordpress at all. Further, something seem to break wordpress’s media flash uploader, either due to f8 lite, your galleria plugin or the google-ajax-libraries plugin. Is f8 any better? Does it work correctly with wordpress 2.7.1 (and 2.8)? I’m really not into beta software, I want something that works nicely and as advertised out of the box. Fantastic theme! This has a kind of movement to it. Thanks for sharing! I am looking for similar options…but I am worried that it might be slow..
real great themes…hope you wil get some new one. thanks for the lite theme and waiting for the new ones. by the way its can be changed from fixed to fluid which makes it awesome either way. How do I get the photos to appear in the post on the home/post page? I can get them into post but they don’t show on the above pages. I am very disappointed. I love this theme and I’m very excited to use it but there is literally no support. I signed up for this website but did not want to pay, but it seems that unless you pay you can’t receive support? I have read people saying that the new version with the new version of wordpress doesn’t allow for customizing so you need to use css. Every other theme I have tried includes pages and pages of support for free, can you please contact me with some information on receiving support for simple things such as how to get my pictures to appear. Please read the instructions.html file contained in the download. Support takes time. Time is money. If you need our support, we have to charge for it. The alternative is totally unsustainable as we have tens of thousands of free subscribers and only three of us. this is a really great theme, greetinbgs from germany! I seem no reply from the Author. I just tried this theme it look great but face same don’t how to configure it. Well while play around with it, I managed alternate my images. Go to your post > Custom Fields (Name: image, Value: link to your image). Hope this help. I wonder how to create the thumbnail and change the link under the main image. I have the same problems as you and the author can develop a simple and easy to use daemon. CSS changes so that people will not be easy to use. I tried the custom field fix for the failing slideshow (WP9, F8-lite). Did not make a difference. It’s hard to believe that someone at GPP doesn’t read all of the comments here about this and mention something. @Everyone – For instructions on configuring this theme, please read the instructions.html file included in the download. I managed to figure out how to get the theme to work, but does look as the instructions may be out of date. 2. Forget the slideshow folder part as it is not required to get it to work. 4. There is a bug the code php which stop you clicking on the image to enlarge the picture, it looks as it is using a function that may no longer be available, I am using WordPress 2.9.1. I edited the image.php file and remove lines 6 and 8 to allow the image to be displayed. 5. Also you have to upload the images to ensure that you get the images the correct size. Apart for that it works well. hi, i also manage to display the image but only one image, its not displaying any other image that i put, any idea? The instructions.html doesn’t work for my blog. I can get the thumbnails to appear with each post but the slideshow will not work. This is the problem that a lot of people are having. I have included the “image” custom field but no gallery. I’ve linked that to the medium image and I’ve even tried it with the full sized image but with no luck. I read that the slideshow only works with the #1 category. Maybe I’ve deleted the #1 category and now I have other categories that the slideshow won’t pick up? No matter what I do it only displays the blog name, the phone number, and the email. I am a web designer with a lot of experience with wordpress. I am using this blog theme for my personal portfolio, but I can’t get it to work. Does anybody know why? It seems like tons of people are having trouble and the only support help says “look at the instructions”… I have and it doesn’t work! Category issue maybe? Can I change that in the code if that is what’s wrong? can anyone say me where i can download the old version (F8 Lite 1.2.1) ? I need this Version because i use wordpress 2.7. And the new version have a bug with 2.7.
theme compatible WP 2.9 ???? I don’t think it is compatible to to 2.9.1. I have been trying to get the slideshow, in F8 light, to work for the 5th time. I am ready to find a whole different WP template. I’d really like to use F8 but I still can’t figure out how to get the slideshow to work and the posts to show the thumbnails on the front page of the site. There is no slideshow folder to add images to. Under the “upload/insert” button on the post editing page, I’ve selected an image to be a thumbnail and inserted it into the post, and still it doesn’t appear on the slideshow or in the post summary on the front page. How do you change the right corner with your email and phone? I don’t want the default 1800 and fake email. I’m trying to use the F8 Lite template but the slideshow is not working. I’ve already added photos into the Slideshow folder. It only shows the one titled image1.jpg. Ok i worked out 1 thing. I have to have multiple posts in order for it to work. Initially i only had one post. Now when i added a second post the slideshow is working between image1 and image2 in the slideshow folder. Can i keep the slideshow running all the time? Hey guys, just wondering if this version also supports video?. Most of my portfolio is video content and I’d like to use one of your templates. Cheers-. How do I change the page links to actual pages. Next to the home link tab I have three page tabs that say “link” how do I make them say what I want? Hi, I’ve the same question! Did you get the answer? images are stretched and the images cropping/editing doesn’t work! many thanx for F8-Lite… great theme! can I upload an image (950px wide) to go over the black line at the top? Hi! The slideshow for my f8 site is not “in motion”…. it only shows the last image from the last post. I am pretty sure it’s supposed to go through all of them but I’m not sure how to conrol that. Anybody know what might be going on? Thank you! Hi! The slideshow for my f8 site is not “in motion”…. it only shows the image from the most recent post. I am pretty sure it’s supposed to go through all of them but I’m not sure how to control that. Anybody know what might be going on? Thank you! Hi, I’m using F8 Lite for a client and want to change a few things around. I’ve been looking through the php and can’t seem to find where to change the color of the Navigation boxes (from black to white) and the text (white to black). Any help would be great. Also I want to change the text color of the blog title from red to black. Is this all done in stylesheets.php? I’m pretty inexperienced with all this but know a few things. I would like to move my site http://www.wapmasterszone.com to wordpress, will it be a good choice ? F8 Lite it’s a very nice theme, but we need an update to use it with the last version of WP.